Bald Eagle soars over Delaware County, October 6, 2011. So I'm driving home from work this evening. I take the back roads, mostly county and township routes through corn, soybeans, and woods. I look up, down, and around, because I never know what I'm going to find. As I was driving the Subaru tonight though, I looked up at a group of swirling turkey vultures. The lowest one baffled me for a second, because it had a white head. BALD EAGLE! I slam on the breaks, back up the car, park on a farm lane, and get whip out the telephoto lens. It's still gliding above me, and I fire off a salvo of images before it slowly drifts out of camera range. Everyone loves the American bald eagle. In fact, my posts on the eagles of Highbanks Metropark are the most visited pages on my entire blog (which is quickly approaching 1000 published posts). Eagles can be seen across Ohio. And although I see them often, I rarely get such a treat on my drive home. What a beautiful bird. We actually see bald eagles here in NYC, too, strange as it may seem. I haven't seen them myself, but a fellow NYC blogger took wonderful photos of two bald eagles fishing off an ice floe in the Hudson two winters ago! Very interesting- It makes sense- Bald Eagles like to be around water, and they don't need that large of an area of trees to nest. Plus, I'm sure they hang around there as well during the winter. Next time I'm in Manhattan, I'll have to see if I can find any eagles! Fabulous image! We had one circling our preserve a few weeks ago--moving south I'm sure. I was even startled to see one circling over a Wal-Mart parking lot in the midst of the dense suburbs a few years ago, too. Thanks Scott- It's quite a comeback story, really, the Bald Eagle. It's sad to think we almost lost them here in Ohio. I did find out that Ohio has used red bands on its eagles- we don't band them anymore, but this could be an Ohio bird. The bird is definitely banded, I check my other photos, some of which clearly show a red band. I am happy that I am not the only one who drives around looking for something to capture with my camera! I am guilty of taking my camera (and tripod) with me wherever I go! You're pictures are AMAZING! 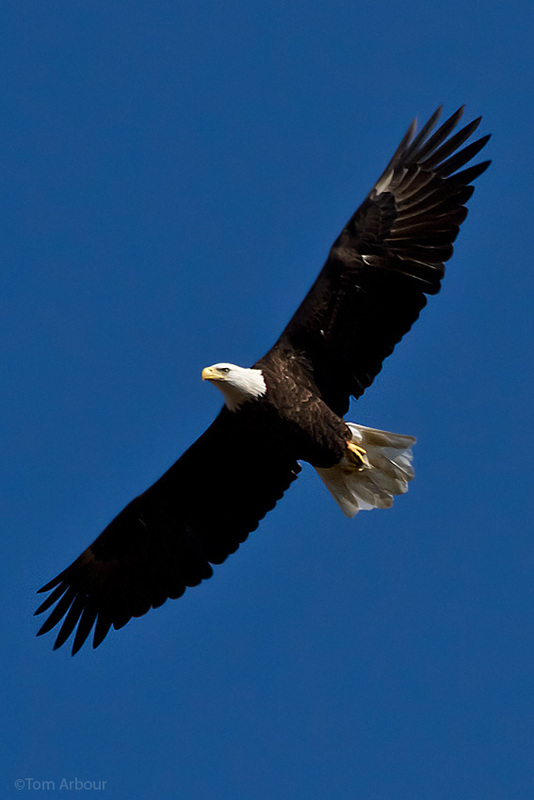 Bald Eagles are such amazing birds and I think breath taking! Time to Build an Arc?